A simple closed curve or a polygon formed by four line-segments or sides is called a quadrilateral. The four line-segments forming a quadrilateral are called its sides. For example - squares, rectangles, rhombuses, trapeziums and parallelograms are quadrilaterals. A quadrilateral has four sides and four angles. The symbol of a quadrilateral is □. Each shape shown below is a quadrilateral. (i) Shape (d) is a special type of quadrilateral. Its opposite sides are equal. Each angle of it is a right angle. Its name is rectangle. AB = CD, AD = BC and ∠DAB = ∠ABC = ∠BCD = ∠CDA = 90°. (ii) The quadrilateral (e) is named as square. All the sides of it are of equal measure and each angle is a right angle. In the above figure, AB = BC = CD = DA and ∠ABC = ∠BCD = ∠DAB = ∠CDA = 90°. (iii) Shape (f) is a quadrilateral having the special name parallelogram and with opposite sides equal and parallel. It has also its opposite angles equal. In the above figure, AB and CD are equal and parallel. Similarly, AD and BC are equal and parallel. ∠DAB = ∠DCB and ∠CDA = ∠CBA. (iv) Shape (g) is the shape of a rhombus whose all sides are equal. 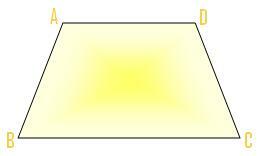 A rhombus is a parallelogram with all its sides equal. Its two opposite angles are equal and greater than 90°. Its other two opposite angles are equal and less than 90°. Note: A rhombus cannot have any right angle. In the above figure, AB = BC = CD = DA. AB is parallel to CD and AD is parallel to BC. No angle is right angle. 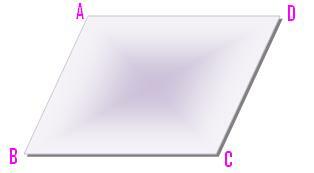 (v) The quadrilateral (h) is the shape of a trapezium. A trapezium is a quadrilateral which has a pair of opposite sides parallel. In the above figure, opposite sides AB and CD are parallel. A polygon covers a plane space whose area may be calculated. 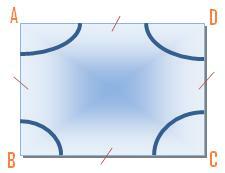 The length of the covering sides is called its perimeter. Note: The sum of angles of a quadrilateral is always 360°.